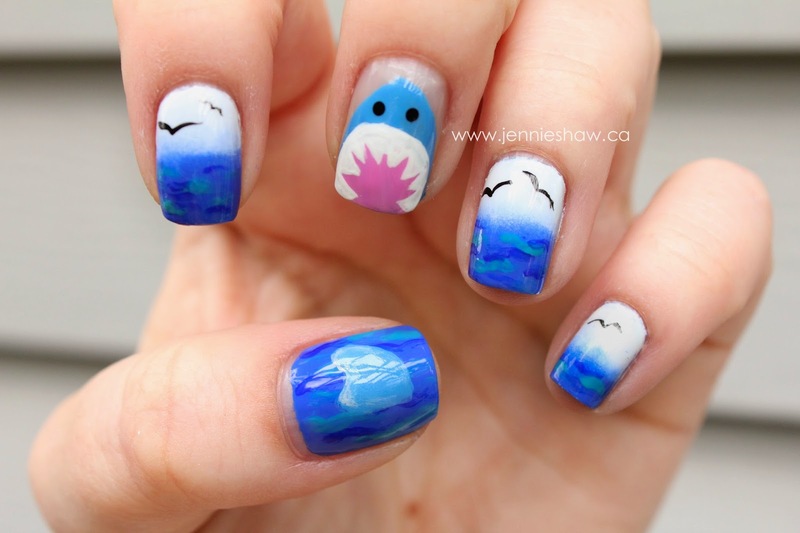 jennie's nails and tales: the nail files: shark attack! 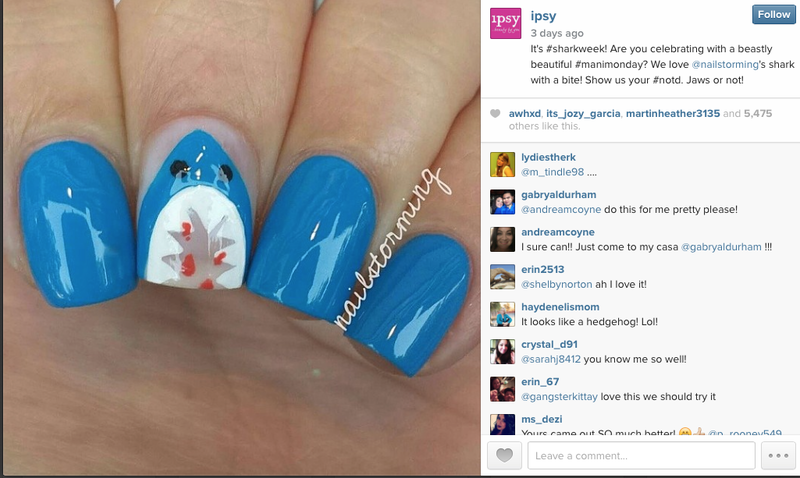 I'm not super into Shark Week, but I am into themes, so I decided to give it a go. And it turned out pretty well, I think! Yay! 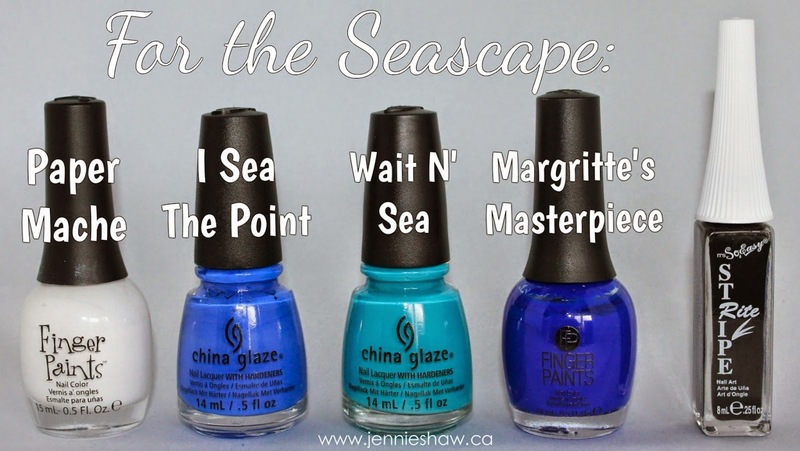 I started with one coat of I Sea the Point on my pointer, ring, and pinky finger, while my thumb got two coats. Using a triangular makeup sponge, I painted a stripe of Paper Mache with a stripe of I Sea the Point below, and then sponged it (happy, Bailey? Haha!) onto my pointer, ring, and pinky finger. It still wasn't quite opaque though, so I did two coats of the sponge. Then I did a coat of quick-dry top coat, to seal it. 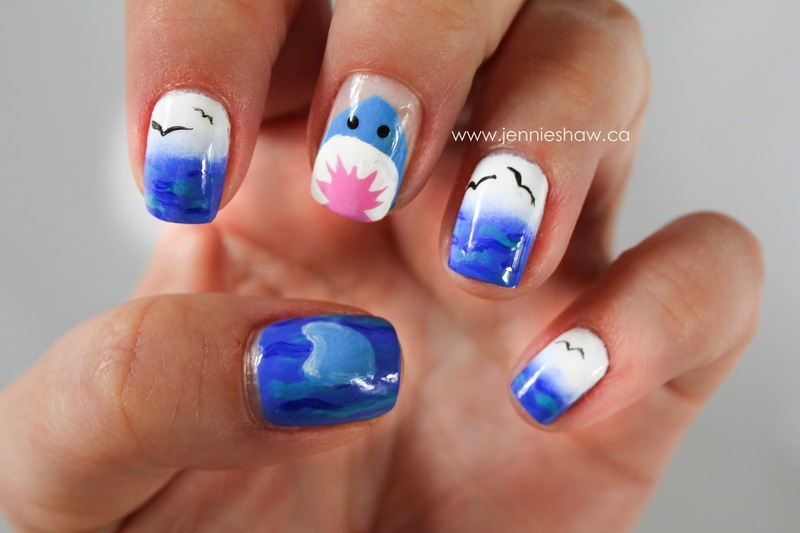 With a narrow nail art brush, I painted random squiggles for waves with Margritte's Masterpiece and Wait N' Sea. The birds were done with the black Stripe Rite, and the shark fin used avenue maintain, with some highlighting from OPI's I Want to be A-Lone Star (not pictured). No base colour, only clear base coat. With the brush from avenue maintain, I made a rounded triangle for the shark head. Then, I used Dance Baby for the inside of the mouth, and went over the outline with white Stripe Site, making small triangles and then filling them in, for the teeth. Two black dots for eyes finished it all off. This mani was a lot of fun to do, so thanks for the challenge, Daniela! And what do you think, did I nail it? Haha! Uhm, I'm sorry? Your manicure is the freaking bomb.com. You're SO GOOD at all of this stuff! I couldn't draw a picture like that on paper. Forget using polish and doing it on my nails. You rock, girlfriend! Holy crap Jennie. What an artist you are!!! So much detail. It's beautifully brilliant! haha omg I love it!! I love all the background stuff! It's anatomically incorrect (the eyes are on the other side of the snout from the teeth) but all in good fun! Now I now that shark week is officially a Thing. So excited to find you!! I'll be linking up with you weekly!! Love your mani!!!!! !